You should specify the exact time and date when the task should be run. You should specify the time period after which the task will be run. The exact time for running the task is estimated at the moment when the task is saved. Thus, even if you exit xStarter and then start it again, the task will still be run after the specified period of time since when the task was saved. It will not be run only if the estimated time has been missed. You should specify a time interval at which the task will be run again and again. The countdown starts either since xStarter is started or since when the task was saved. 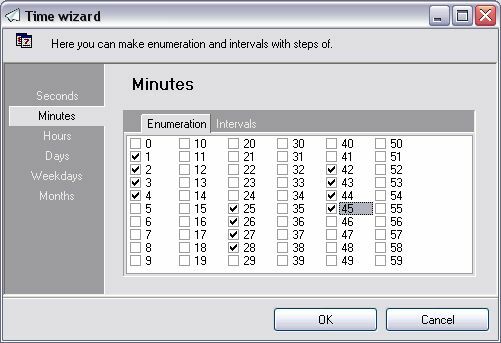 You can specify units when to run the task either as a simple enumeration (selecting from the list of possible values) or as intervals during which the task will be run at the specified steps. For example, if a task is set to be run at 14:00:00 on days from 1 to 10 at steps 2 and on days from 15 to 30 at step 3, the task will be run at 14:00:00 on days 1,3,5,7,9, 15,18,21,24,27,30 of any month. 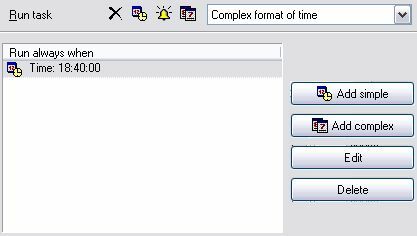 When this mode is selected, the list with «time masks» and buttons for editing the list are displayed. Adds a simple mask where it is possible to specify the time for running the task, enumerations and intervals for days, as well as weekdays and months in the list of «time masks». When you click the button, an additional window is displayed, where you can enter the necessary parameters. For each time unit there is a different tab with the corresponding options. The tab for days consists of two separate parts for specifying enumerations and intervals. Adds a compound mask where it is possible to specify enumerations and intervals for seconds, minutes, hours and days, as well as weekdays and months in the list of «time masks». When you click the button, an additional window is displayed, where you can enter the necessary parameters. For each time unit there is a different tab with the corresponding options. The tabs for seconds, minutes, hours and days consist of two separate parts for specifying enumerations and intervals. After you make an addition to the list of «time masks», fields for a new mask appear. Opens the window for editing parameters. There should be a «time mask» selected in the list. Deletes a «time mask» from the list.There should be a «time mask» selected in the list.